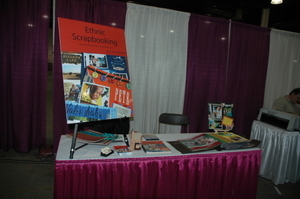 Here's a bit of history behind some of the layouts in Ethnic Scrapbooking. You will find this layout on page 86 of the book and one I'm sure many can relate too. I'm just back from a mini-excursion to New York City where I got a huge dose of cultural diversity, but this trip was a bit different because I was with my globe-trekking sister, this was our first time experiencing Manhattan together. The bit of history/trivia about this layout is that those are actual bottle caps on the bottom of the page (which makes it very heavy and lumpy) which is not a good thing for scrapbooks, so use them very sparingly. 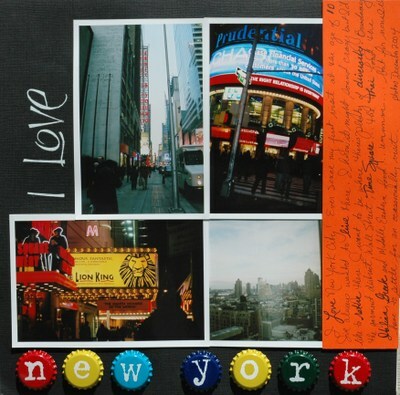 When my husband saw me making this page, he finally said, "Well, you've got entirely too much scrapbooking stuff!" To which I replied, "Just like that entire garage full of stuff you have!" I had a great time sharing the book at the "Real Women Colossal Crop" at the Memories Expo in NJ this weekend. I was a bit nervous because of recent discussions about the book title, but people got it! They got that each one of us has an ethnicity and that my one-of-a kind idea book is applicable to everyone. Julianna Hudgins, I want to thank you for sharing your ethnic heritage with me and how my layouts prompted your thinking. I met quite a few NY/NJ teachers who really loved my concept and live it out daily since they teach children from so many cultural backgrounds. They were super excited about many of the products they saw in the layouts. Keep checking back, I'll be adding a resource list to the side bar in the upcoming weeks. The biggest thrill I got was how many people thought my layouts were so artistic...not what I expected, but a wonderful bonus. I hope to do some book signings in NJ in June when I scoot up to CT for a graduation, so stay tuned.